This form needs to be filled up by the administrators of any school. 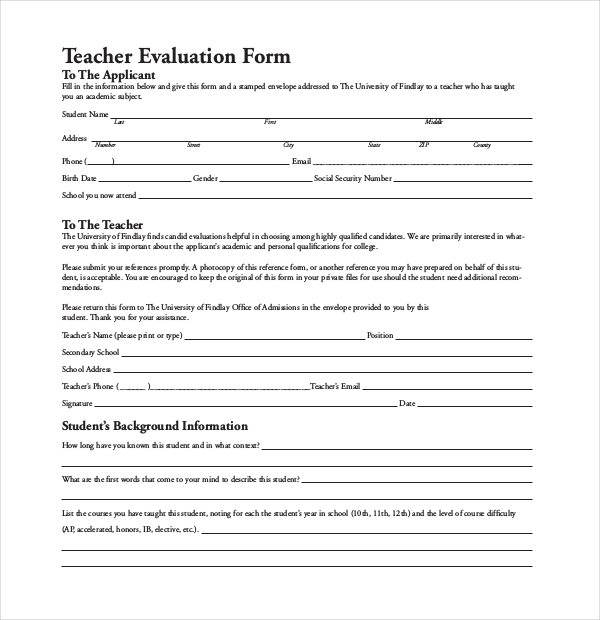 This form contains questions about the relationship between the students and any particular teacher, the teacher’s quality of managing the environment of the class, the interpersonal skills of the teacher and so on. 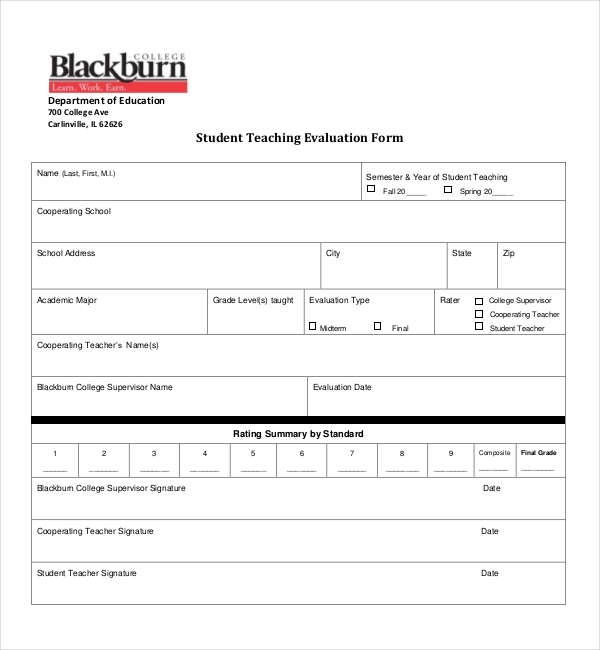 This form helps to measure all the aspects of the teacher’s performance. 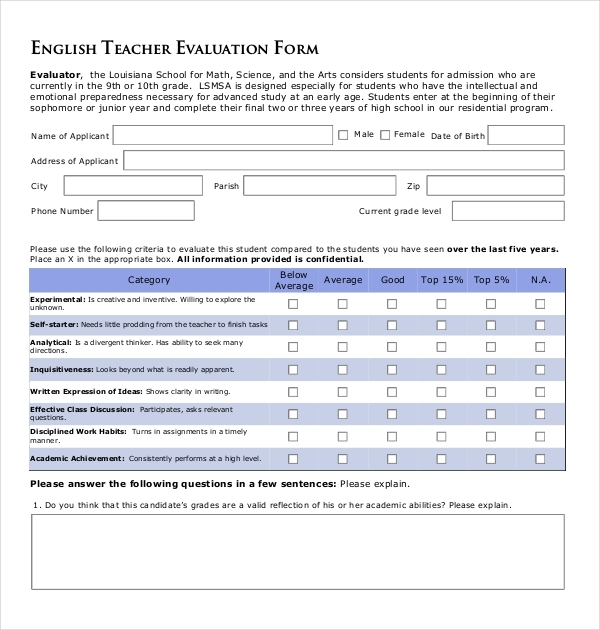 Generally, this form has several domains which cover all the aspect of the performance of a teacher. This form aims to offer a share definition of the works teachers do with colleagues and students. These kinds of forms required to be filled up at the end of an academicals session. 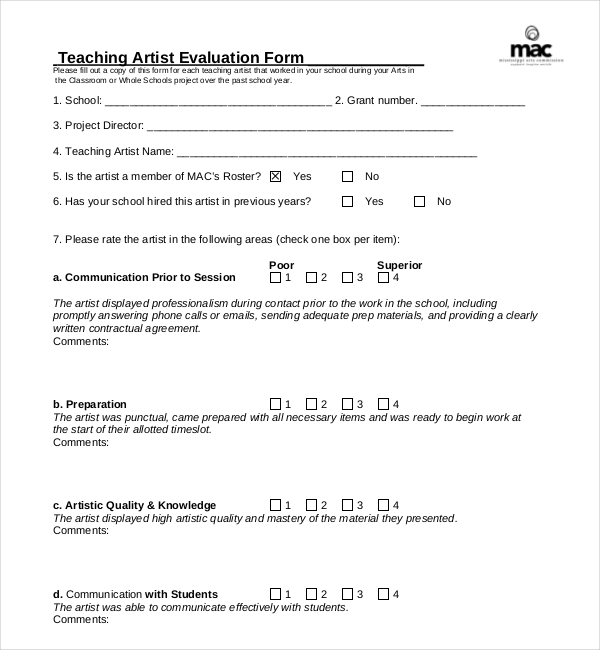 This form is used to evaluate the performance and ability of an art teacher. 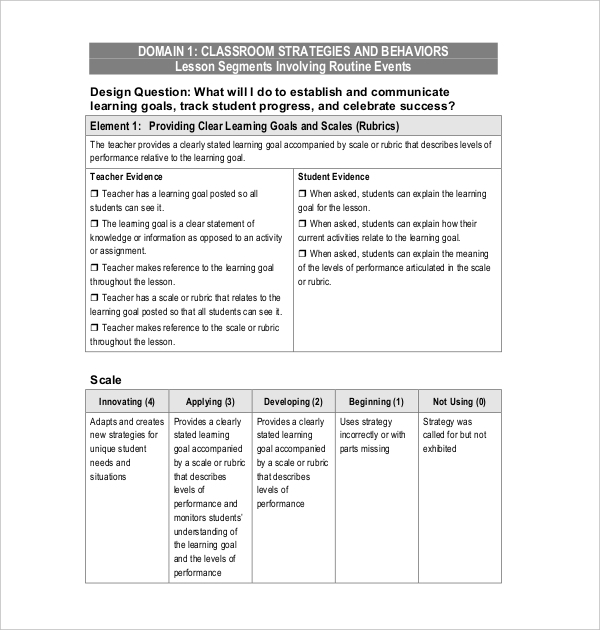 These types of form includes questions to rate the teacher’s artistic skill, knowledge, the communication skills with his/ her students and other teachers, teaching techniques, the ability to manage and control the classroom and so on. Handling and taking care of children are not easy tasks to operate. A child care teacher is supposed to be up to the mark. 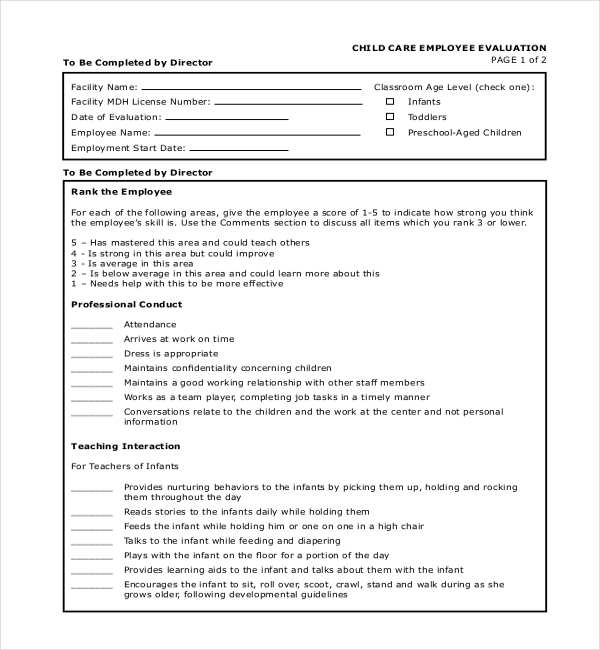 A child care teacher evaluation form helps to measure whether the teacher is capable of taking care of the children properly or not. In addition to it, this form is also used as a tool for promotion and dismissal. This form is a useful tool which helps to rank the employee in every aspect. This evaluation form needs to be filled up by the director of the company. The director needs to give the teacher a score of 1 to 5 to mention how strong the employee’s skill is. 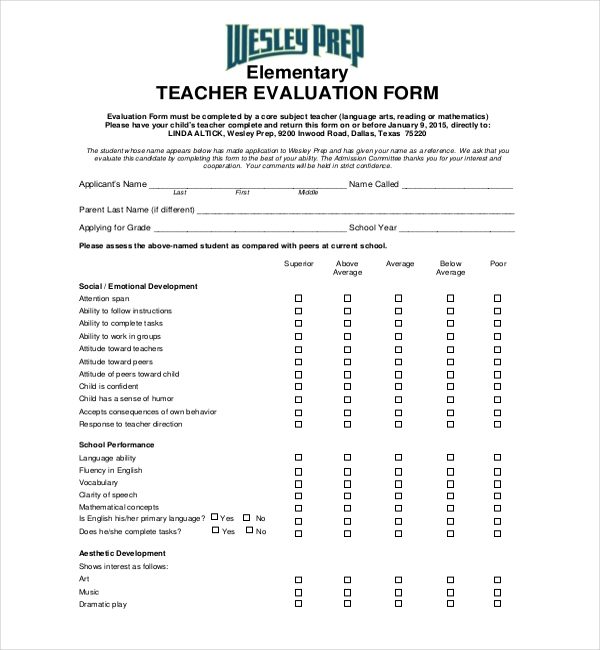 This form needs to be filled up by a teacher to measure the ability and performance of a student. The teacher needs to rate the talent of the particular student by comparing him/; her to the other students. The teacher also needs to explain whether the grades of the student speak for his/ her ability. This form is to be filled up by a core subject teacher. The teacher needs to measure the ability of a particular student. The form aims to measure the school performance of the student. It also helps to analyse whether the candidate has the ability to follow instructions, complete all the task perfectly within given time and so on. 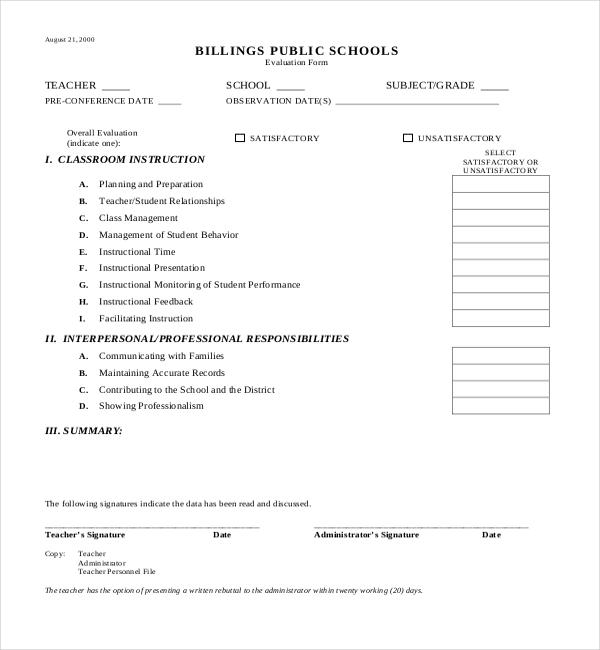 This form is supposed to provide the information about a teacher’s conducts and management techniques. This forms includes seeks information about the teacher’s capability of generating and maintaining a positive classroom environment, implementing new techniques to enhance student learning, managing the behaviours of the students, utilising the time effectively to improve student learning and so on. 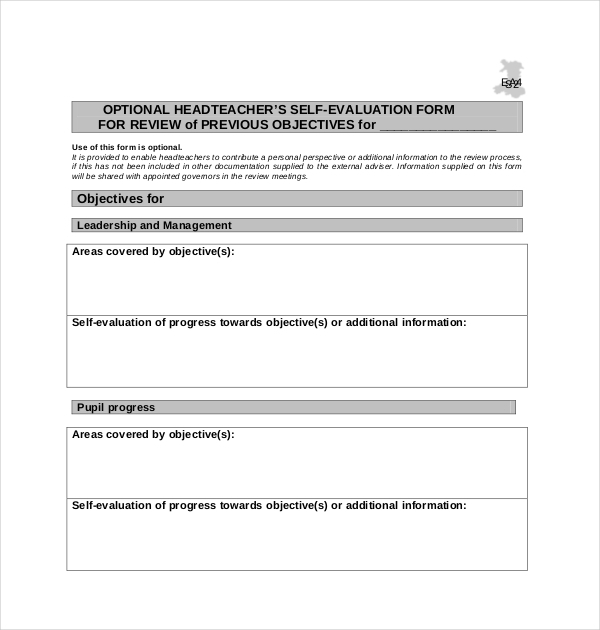 This form makes the head teacher able to check the performance of the staffs. The head teacher can guide them regarding their responsibilities after checking out their records of performance. The head teacher also can set goals for the future after understanding the abilities of the staffs. The form is a useful tool to measure all these. 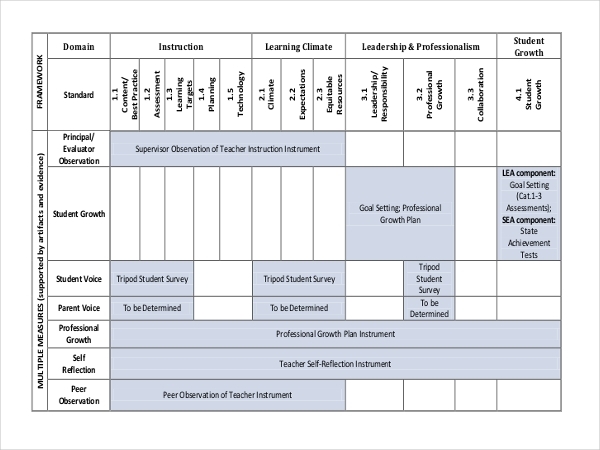 This form helps to measure the professional growth of the teachers very effectively. The aspect of the quality of a teacher really matters. The future of the students depends on what they learn. A teacher should be efficient enough to lead the students to the right path. Therefore, it is a prime need to measure the quality of a teacher. 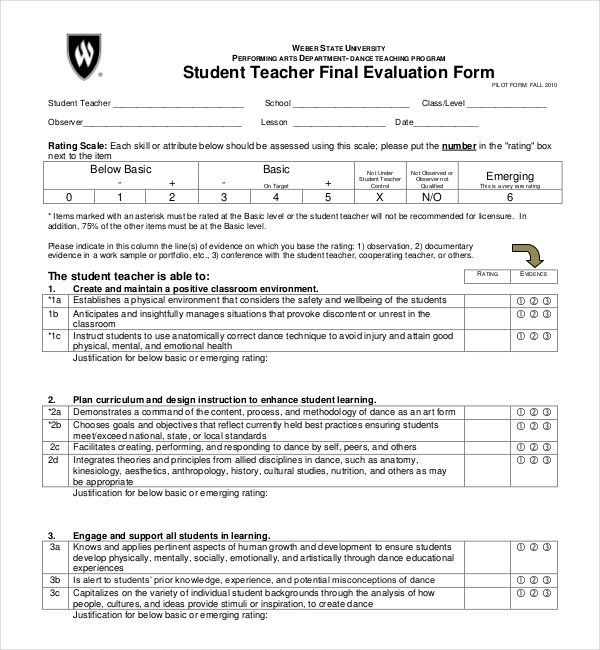 This evaluation form is based on a number of essential aspects including what works in schools, effective classroom managements, proper classroom instructions,the art and science of teaching, classroom assessment, grading and effective supervision. 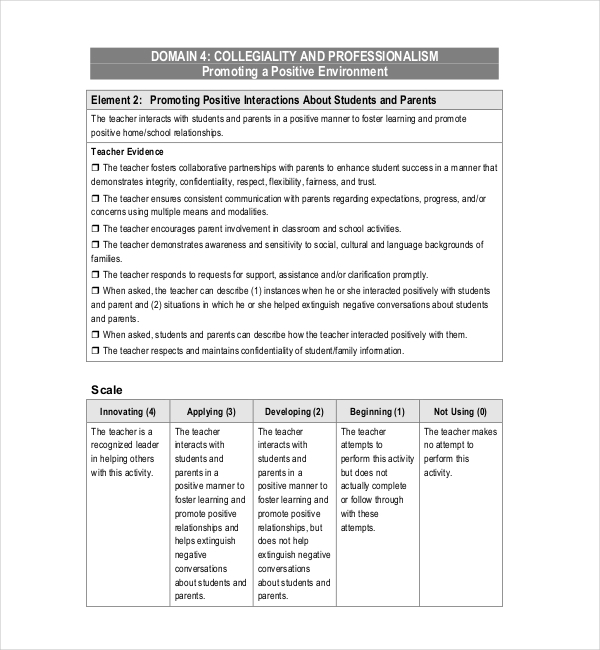 The sample of this form has four domains such as planning and preparing, reflecting on teaching, classroom strategies and behaviour, collegiality and professionalism. This form provides the authority with the opportunity of ranking each employee according to their performances. The rankings are given on the basis of the employee’s personal behaviour such as attendance, punctuation, dress code, good interpersonal relationship and so on. The form also helps to measure the professional antidote of the employee. The teachers of any university can refer a student for higher studies by mentioning about his / her capabilities in this evaluation form. The evaluation of any candidate’s performance is a useful tool for any university. It helps the authority to determine whether the student deserves to get admitted or not. This form makes the teachers able to rate the behaviour of the students. Each of the rating should measure what is natural for the age of the child who is being rated. The rating also reflects the behaviour of the particular child since the beginning of the school year. This form helps to elaborate the foundation of yoga, philosophy and ethics of etching, the attendance of the students, and the practical experience of the teacher and so on. 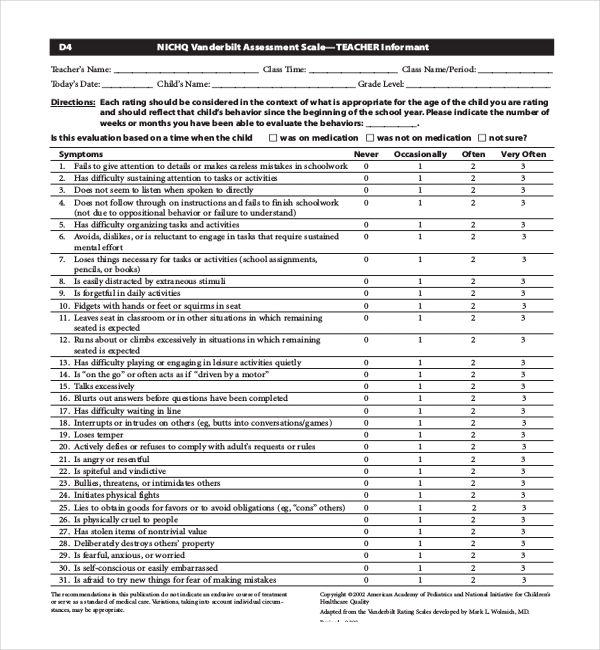 A yoga teacher evaluation form also provides several details about the program details and the schedules of each yoga class. Music teacher evaluation form aims to focus on the classroom managements, activities required to improve student learning, instructing the students properly, the techniques of teaching, proper tactics of supervising the growth of the students, classroom etiquettes and behaviour, professionalism and flexibility, skilful classroom managements and so on. 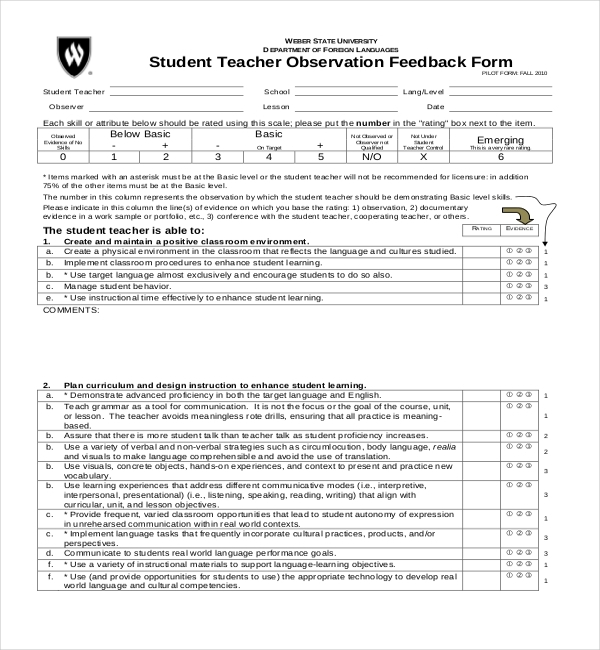 Using a teacher evaluation from to have the feedback at the end of a training year serves as a very useful way to analyze the overall performance of the training institute. Therefore, if you are wondering how to create an evaluation form, you need do a bit of research to get effective outcomes. You have to determine the priorities of conducting an end of session analysis. This will help you to form the questions which need to be asked. The teacher evaluation form needs to be filled up only by the teachers, students and the members of the authorities of any training institutions. These kinds of forms must not be used for any other reason apart from gaining feedbacks. The students or the teachers should not use the forms as a way to fulfill their own interest which comes along with a wrong intention. These forms needs to be filled up and submitted properly. The individuals have to think well before making any comments. Nobody should destroy the image of the particular institute by passing any remarks wrongfully. Every form was built manually when there were no uses of computers and internet connections. But nowadays, we can retrieve any information quickly with using the availability of internet connection. We also can download the samples of any kind of documents from browsing the web. Things have become so much easier with the development of science and technology. 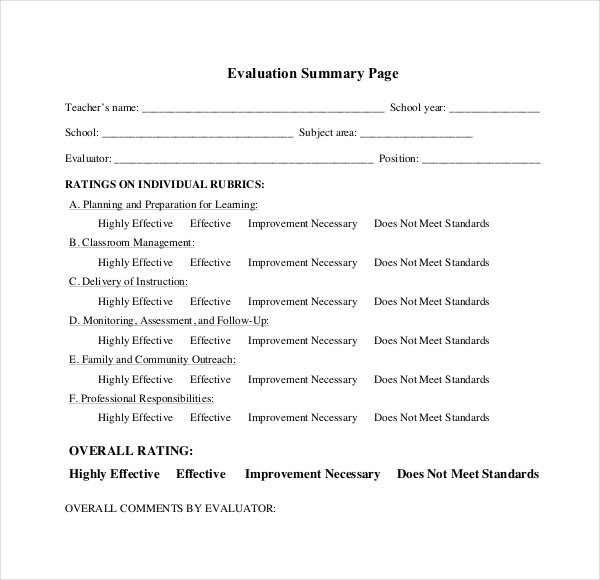 There are arrays of teacher evaluation forms available on the internet. You can easily download one as per your needs and preferences. These forms are available in the PDF format. You can also get them in word format. If you are finding it hard to download the proper kind of form regarding your need, let us take the burden of finding it for you.